New arrivals stocked in at our retail stores every Monday and Thursday! Backorders are up! Don't miss the second chance for our top favourites! Welcome April in with these exclusives! Click in to find out more. Made of linen blend, fully lined at bodice. 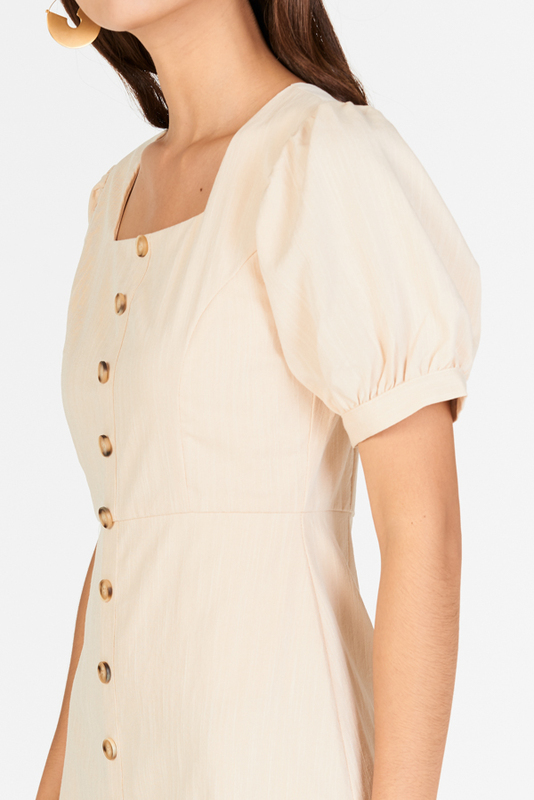 Features a square neckline and pouf sleeves with faux tortoiseshell buttons down at the front. Complete with a concealed back zip closure. Non sheer. This product is also available in SIERRA, SPRING MINT, LIGHT PINK. PTP 14.5" 15.5" 16.5" 17.5" 18.5" 19.5"
33" 33" 33.5" 34" 34.5" 35"
12.5" 12.5" 13.5" 14.5" 15.5" 16.5"
18" 18" 19" 20" 21" 22"
13.5" 13.5" 14" 14.5" 15" 15.5"
5.5" 5.75" 6" 6.25" 6.5" 6.75"
Model is a Uk 6, 172cm and wears size S.
Join our mailing list Join The Mailing List And Receive 10% Off Your First Purchase!